The X-15, was designed to provide data on material and human factors of high-speed, high-altitude flight, and made the first manned probes into the lower edges of space. It was built for speeds of up to 4,000 mph and altitudes of 50 miles, but these goals were exceeded on numerous occasions. Several X-15 pilots earned astronaut rating by attaining altitudes above 50 miles. The X-15 flight program contributed significantly to the Mercury projects, Gemini projects, and Apollo projects. The X-15 was carried aloft by a B-52 mothership and was released at about 45,000 feet and 500 mph. Its XLR99 rocket engine then fired for the first 80 to 120 seconds of flight. The remainder of the 10 to 11 minute flight was powerless and ended with a 200 mph glide landing on a dry lake bed. The first powered X-15 flight was made on Sept. 17. 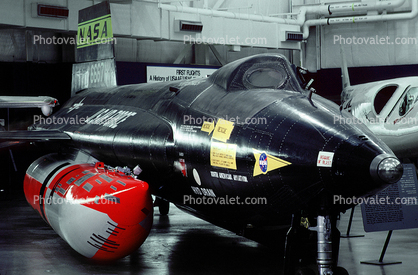 1959, and 199 flights were made between 1959 and 1968 by the three X-15s which were built. The No. 1 X-15 is at the National Air and Space Museum and the No. 3 X -15 was destroyed in a crash. The No. 2 aircraft was retired to the U.S. Air Force Museum in Ohio in October 1969.